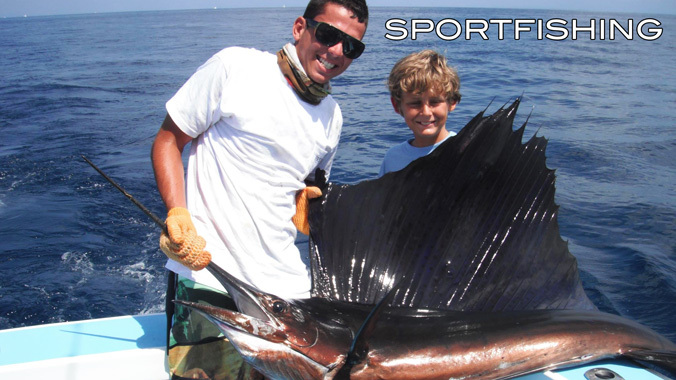 During the peak month from November through April it is not unlikely for anglers to release up to fifteen sailfish in a day. While you are out there you also have a good chance of raising a Blue, Black, or Striped Marlin, as well as Dorado(Mahi Mahi), Yellowfin Tuna, and Wahoo. If inshore bottom fishing is your game, Quepos boosts a world record Snook, caught off of the mouth the Rio Naranjo, and is home to Dog Tooth Snapper, Grooper and Jack Travoli just to name a few. For those of you who enjoy big game fly fishing there are various companies who specialize in fly fishing for Sailfish, Marlin, and so on. There are a wide variety of boats working the waters off Quepos and can find accomodating charters in just about every price range. Average rates are as follows.